We have today launched a new service available across the UK to anyone who wants the services of a solicitor. Basically, a member of the general public can email us their query, together with their location, and we will recommend a firm of solicitors in the area. Time to put our expertise into practice in a different way! We know firms with good reputations, and those who need to improve, so perhaps are in a somewhat unique position to be able to recommend some as opposed to others, or to recommend our candidates or clients if work comes our way. Visit http://www.ten-percent.co.uk/find-a-solicitor for details. Jonathan Fagan, MD of Ten-Percent Legal Recruitment - no.1 online UK legal recruitment agency. Do not ask clever questions in response to the interviewer’s questioning of you. She is there to offer you a career break, and you must be nice to her at all costs. Practice potential questions before going into interview. Check out our website for details. Think about problems you have overcome prior to interview. A sporty or activity problem, a legal setting problem, a team setting problem and an academic setting problem will probably give you enough to be thinking about. Smile or look interested at all times. 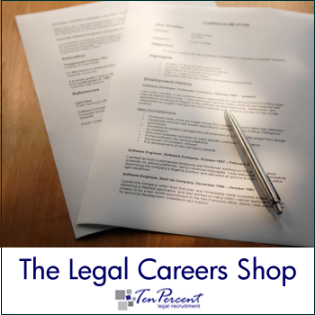 Try and think about what the interviewer is looking for – a competent lawyer, someone they can work with who has similar interests, someone who is going to be an asset to the firm. Think carefully about questions at the end of the interview – social events are a good topic as it shows a balance in your life or work and play. Legal Interview Question 9 (with answer) - Do you prefer to work in a team or on your own? Difficult question again - devil and the deep blue sea! You could come down with the 'I am an innovator, and prefer to develop my ideas as an individual, as well as take responsibility for my caseload'; but you will then get a question thrown back about your inability to thrive in a team environment. On the flip side of the coin if you go for the team approach, you can then get questioned about your inability to come up with your own ideas, and need to hide behind others! Probably the best approach would be to say that you have no preference - you enjoy working on your own and taking responsibility for your actions, but that you also enjoy being part of a team and contributing to that with your ideas and skills. Legal Interview Question 8 (with answer) - Why do you want to leave your current firm? There is no answer to this question that will result in a positive response - there has to be a negative unfortunately! The aim with all job interviews is to ensure that everything that is said is positive. If you say something negative, this always gives the interviewer something to come back on. Unfortunately this question does not leave much scope for avoiding this - a response like "I have come as far as I feel the firm can take me" is about as wishy washy an answer you can give and avoid the negative effects of a lot of other responses. Saying something like "because my senior partner is the most irritating man I have ever met" will not go down well, nor will "I want to leave to avoid the harrassment of the secretaries". Very hard to avoid anything really, but think about it from the firm you are joining - the partners interviewing will immediately look into the future and imagine you going to another firm and complaining about them...! Legal Interview Question 7 (with answer) If you could take one celebrity to a desert island, who would it be and why? This question is the light-hearted one that is occasionally thrown into interviews by larger firms to see what you say. It used to be said that the majority of candidates wanted to take Margaret Thatcher or Nelson Mandela with them, and the explanations used to send the partners to sleep. Apart from suggesting you want to take Paul Daniels with you so that you could say "Now Thats Magic" and make him disappear without anyone knowing, I would advise giving a humorous answer to this question. Not over the top - eg "Kylie Minogue - so I could get to know her more intimately", but something fairly light-hearted. Whatever you do, don't start to waffle on about human rights lawyers - you really wouldnt want to take Michael Mansfield with you would you? Really? London Legal Recruitment - are jobs better paid? London Legal Recruitment - are the streets paved with gold? Are legal jobs better paid? We get a lot of solicitors registering with us for work in London, who come from provincial market towns or smaller sized cities, and one of the things they always expect to find is that the streets are paved with gold, and their salary is going to double. This can be particularly so in the high street firms, where people expect to find NQ residential conveyancing posts paying £40,000, or crime positions without police station accreditation at £30,000 pa. It is often quite shattering when they discover that there are a lot of solicitors and legal executives working for a lot less than that! I have been in legal recruitment in London for over 15 years, and it has to be said that on the whole salaries are not far off the rest of the UK. The only difference tends to be at partnership level or senior associate. NQ's can pick up good money, but this is usually because they are working at a good firm with quality work, and the caseload pays accordingly. Certain areas of London pay better than others - eg; West London and Central London seem to offer reasonable salaries, whereas North and East London firms often tend to be lower unless they are struggling to recruit. Central London firms pay extremely well if they are performing well themselves. South East London, South West London and Middlesex are generally a rule unto themselves - there are a lot of solicitors residing in these areas, but not that many posts in the South London areas. Middlesex really depends, but when it comes to salaries they can be some of the lowest in the UK. Labels: London - are jobs better paid? 09.02.07 Why do Recruitment Consultants charge so much? We get asked this time and again by some firms - why should we pay you £x,000 to find a candidate, when all you do is send us a CV through on spec. and make a couple of telephone calls? I am sat at my computer at 10.30pm at night typing this, as we are so busy at the moment, I cannot find the time to write during the day. Our advertising budget per placement is around £1,000. That is the figure we will spend on advertising to secure one candidate for whom we identify a firm, send a CV, arrange an interview, and deal with offer negotiations. At the same time, around 30 candidates will have registered, we will have arranged 6-7 interviews, and this will be the end result. We spend over £15,000 on online advertising every year. We also spend sums on Gazette advertising as well, although we are fortunate in that we get a lot of our custom from recommendations via clients/candidates. The cost for a firm to replace a solicitor is calculated as being around £4,000 in advertising costs, time and admin dealing with the recruitment. There is of course no guarantee that an advert will gain any applicants. When I started out in this trade, it took me 7 months to place a candidate and actually get paid. This is not unusual. A lot of people start up recruitment consultancies, but not many continue after the first few months of not generating any income - I see them quite often in the Law Society Gazette - one big ad, no work, lots of money owed to the Gazette! It is very hard work, and I have to confess to wanting to give in myself in those months of no work, money or prospects of income. So we don't just send through a CV. We spend considerable time, money and effort attracting candidates and clients, handling queries from both, giving free careers advice, and dealing with the admin that firms do not need to do as a result. Furthermore we undercut almost everyone else in the marketplace because of our internet operation, and are usually at least 25% cheaper as a result. Can you Become a Millionaire by working as a Solicitor? I have recently been reading a load of books on investment, personal wealth management and similar titles, and have discovered that there are a lot of different strategies for creating your own financial stability. All the advice appears to point to either having a job or business on the side, or to conduct investment at quite a considerable rate. Most of the books refer as well to the need to be satisfied in your own job. I know a crime solicitor in Nottingham who loves his job so much he will actually take a police station or court case from you at no charge and enjoy doing it. Knowing the firm he works for, I suspect the salary he receives is pretty low as well! This question should be changed to whether you can become a millionaire by working as a solicitor in a high street practice. 1. Obtain assets - this is the only way to have a comfortable existence - whether this is a business, a house, a pension or an investment, you have to do this first. 2. Secondly, ensure that you have money to spare on purchasing assets, and always think of the worst case scenario - what would happen if the asset backfired on you? 3. Thirdly, aim to pay off your mortgage asap (buy a house first) and use any mortgage as an investment product (I personally do not agree with this approach - I would rather keep my house out of any investment decisions I make). 4. Do things you enjoy - if you are on a fixed salary, say £35k, you will need to create business opportunities outside of work, and to do this you have to look to your own interests and skills. As a side issue, Ten-Percent Legal Recruitment was started in this way - I developed an interest in the internet and recruitment having been through the process myself some years ago! 5. Don't be afraid to do something similar to others, but you have to have a handle to make your enterprise stand out. Labels: Can you become a millionaire by working as a solicitor on the high street? Legal Interview question 6 (with answer) What salary are you looking for? Today we heard of a new approach to this question. A candidate went for an interview, and after the meeting I received a phone call from the private client partner to say that she had refused to discuss a package with them at the interview. The firm were most bemused by this, although they recognised that some people are not comfortable talking about income during an interview for a legal job. I think it is a difficult question to answer. The usual response I give to anyone who asks for advice on this is to either give a range, or give your current salary, or ask them to tell you what they think the going rate is. In any event, it is important to remember that unless you are working for a firm that have set structures according to level of seniority in the firm, this is entirely negotiable within reason - it has to be acceptable to both sides. Too low and someone resents the offer if they join, too high, and the employer resents employing the solicitor! Be prepared to negotiate, and don't be afraid to contact the recruitment consultant dealing - afterall that is what we are here for. 06.02.07 Sticking or Twisting on salary for Job Offers - what do you do - negotiation with some firms is like a gunfight at OK Corral! I was reminded this week about what fun it can be with firms and candidates when it comes to job offers being made by firms. Some firms make good, competitive offers, which any sensible candidate would accept, and other firms make low, slave wage level offers, which only someone quite desperate to either work or be at that firm would accept. Sometimes, firms offer money which candidates come back on and reject, despite it being a massive increase for them (I had a newly qualified commercial property solicitor turn down an increase of £15,000 once on a £25k salary, on the basis that they thought they were worth more...!). I have also had a firm make an offer which could only be described with the word "derisory" and the candidate accepted it, despite our strong advice to avoid - that candidate is still at the firm, desperately trying to get the partners to increase the salary to something closer to the market rate. How do you go about negotiating? Firstly work out your bottom line, secondly factor in how much you like or dislike the firm, consider the perks and benefits - locality, annual leave etc.. and thirdly make an assessment as to whether you think the firm will go with you or against you on the request. Will it be held against you? Only once you have thought things through will you be able to decide to stick or twist! Any interest, please drop us an email to jobs@tenpercent.co.uk, quoting the ref. no and attaching a CV.